Lettered on the surrounding strap: BRITISH ASSOCIATION MANCHESTER 1842. Beneath is Dalton's signature: John Dalton DCL &c June 28th 1842. Carter's profile of Dalton derives through Benjamin Cheverton's ivory bust to Chantrey's drawing of 1834, NPG 316a(30). It was struck at a meeting of the British Association in Manchester in 1842; another copy is in the Manchester Literary and Philosophical Society collection. 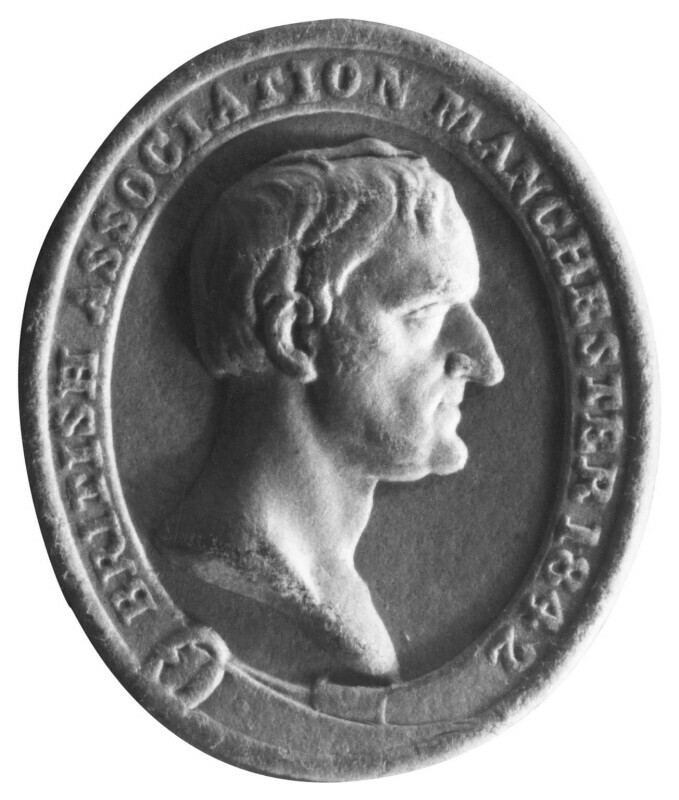 The same profile appears in a silver circular medal lettered (in reverse): JOHN DALTON, D.C.L. F.R.S. Carter F. engraved for the 'British Philosophers' in Bradshaw's Journal. Carter was born in Birmingham and was a pupil of Halliday. Given in November 1897 by Richard J. Greene who had bought it at Sotheby's in November 1893 'among a small lot of autograph signatures'. 'Cumbrian Characters', Kendal, 1968 (46a).